Cumberland, MD – Musician/multi-instrumentalist Anthony W. Rogers announces the release of his second solo album entitled WRONG. The new ten song collection of originals was performed and recorded entirely solo and is now available on limited 180 gram vinyl and download formats. A stylistically diverse and decidedly homemade effort, Rogers recorded WRONG alone at his home in rural West Virginia from 2011-2014 through a multi-track recording layering all the instrumental parts and vocals. Anthony Rogers is a long retired veteran of the local tri-state music scene in many rock and jazz bands in his youth. Rogers continued to blaze his trail through the Washington DC area writing recording and performing original music with local favorites The Now and Ten Below-a band which originated in Frostburg. Besides playing on several recordings while in DC, Tony also performed as drummer on several occasions behind legendary DC vocalist and Grammy winner Eva Cassidy and in several other jazz combos. WRONG was prepared for release with Chris Biondo (Cassidy’s musical collaborator) at his facility in Kensington Md. Rogers also recorded with Biondo as engineer on Rogers’ 1994 solo debut ‘Identifiction’. Although there are no plans presently to return to live performance at this time, this album signals a return to recording activity. “I’m better off to use what very little time I have recording creating and writing. I have a full life outside of this. It takes a lot of sustained focus,” says Tony. Those lucky enough to hear the dizzying and stylistic effort seem to favor the harmony laden wistful look-back track, “White Beach” (about Rogers’ home town); the closer – “Johnny/Janie” a 1950’s influenced let’s runaway theme sung masterfully by his then nine year old children Audrey and Joe Rogers (“People really seem to like this one. It’s easy to understand”); to the more adult themed guitar feedback drenched tribute to his tragically deceased childhood friend Mitch Sanders, “Crunch” (“It’s kind of a twisted blues song for a twisted situation”); and finally, the centerpiece mystical acoustic quasi-prog penultimate track…”Wash” (“the main lyrical gist of the whole record, really”). WRONG is certainly one of a kind… and you can get copy in most cool independent stores in the mid Atlantic/Pennsylvania area and the great Solar Mountain Records in Keyser,WV. 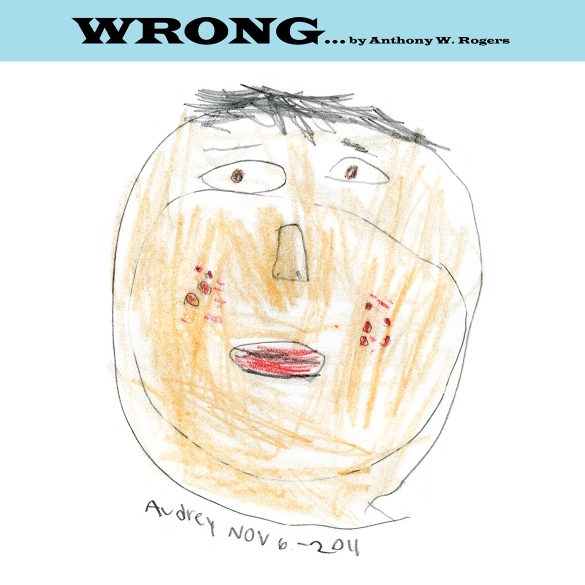 WRONG is also available through the standard download sources (iTunes, CDBaby, Amazon). WRONG is the first release on the Wildflow Unlimited record label which seeks to feature and promote artists on vinyl. This entry was posted on Friday, March 13th, 2015 at 17:59	and posted in Uncategorized. You can follow any responses to this entry through the RSS 2.0 feed. « Legendary Vocal Group The Coasters Celebrate Their 60th Anniversary With Their First Album Of New Recordings In 35 Years!